Based on Yamaha’s widely popular 210 sport boat models, the 210 FSH is well-suited for rougher waters and delivers the added peace of mind that comes with dual engines. 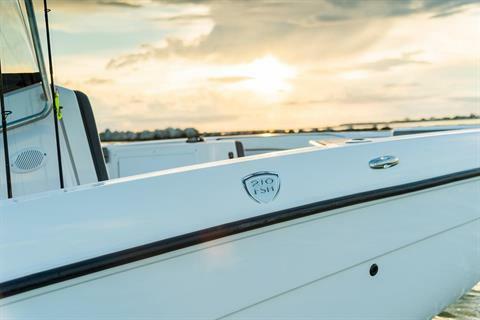 And because the dual engines and driveline are housed in the hull underneath the captain’s leaning post, the boat provides a true, open 360-degree experience that is perfect for fishing. 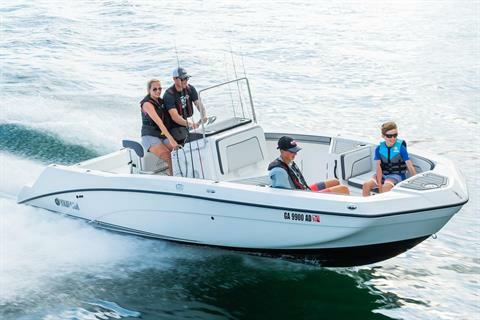 The boat includes all the features that fishing enthusiasts require, along with family features that are perfect for an entire day out on the water to include watersports, swimming, and lounging – all in the same boat, and at a competitive price. The 210 FSH is available in three variations that include the base model 210 FSH, an upgraded 210 FSH Deluxe, and the flagship 210 FSH Sport that offers the features of the Deluxe with the addition of a custom T-top. All three models come with Yamaha's award-winning TR-1 High Output marine engines.Deluxe model upgrades include wiring for dual batteries, stainless steel rub-rail, head compartment curtain, a trolling motor mount, and upgraded seating/cushions. 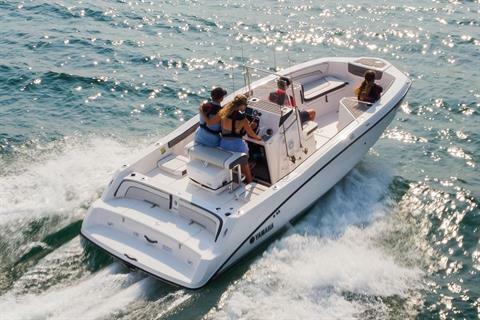 Starting at its large, wide bow, there is comfortable, padded seating with ample room for four adults. The padded cushions snap off, so they are easy to store or leave at home when you are heading out for a fishing trip. Located under the starboard bow seat is an insulated fish locker, and there is a dedicated locker for a full-size Danforth anchor. 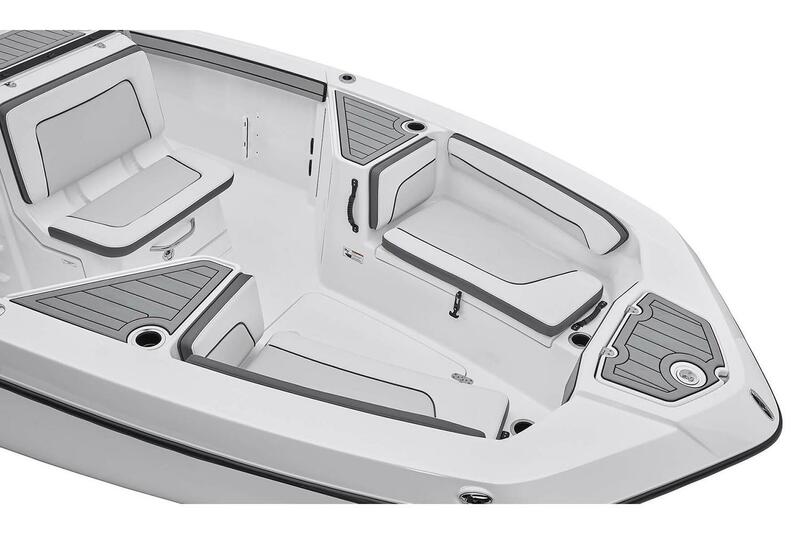 There is more storage below the port bow seat, in the sole, and inside two large consoles. 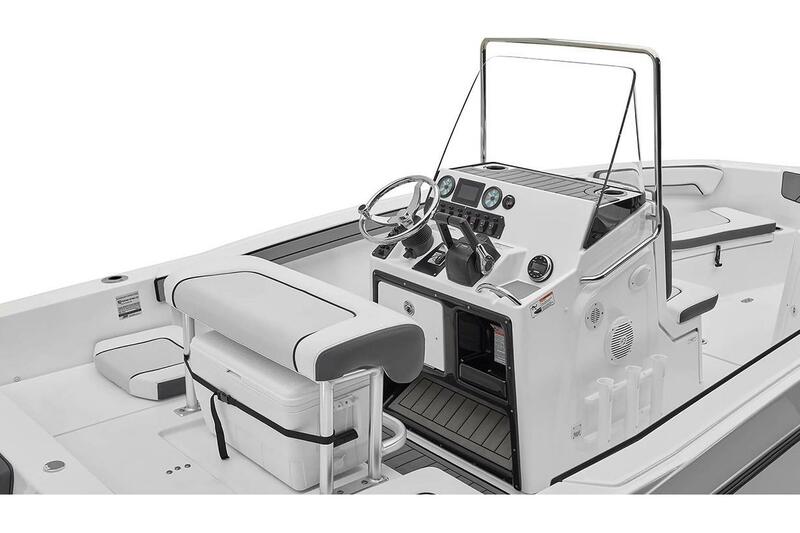 In front of the helm console is even more seating, and the console lifts up to reveal an extra deep, large storage area that can also serve as a changing room or a head compartment thanks to the curtain enclosure that is included on the Deluxe and Sport models. 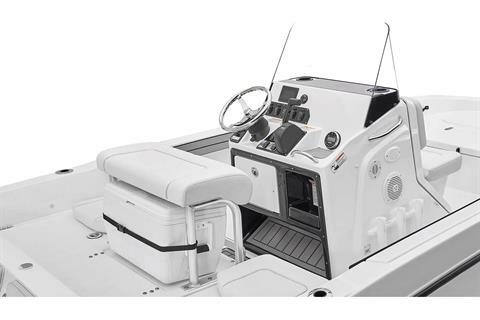 The storage area also provides convenient access to the electronic wiring on the backside of the helm for the easy installation of aftermarket electronics. 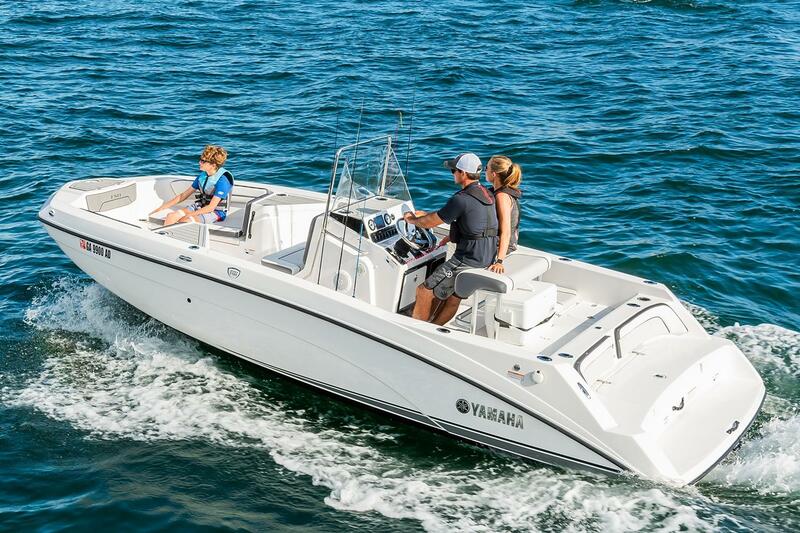 The 210 FSH is loaded with the angling features one would expect in a premium center console boat to include coaming pads, vertical and horizontal holders for 14 rods, 26-gallon aerated live well, and Yamaha's exclusive Jet Wash® system that uses pressure from the jet pumps for easy cleanup of the cockpit, whether you land a big fish or the kids fill the boat full of sand. The helm is thoughtfully designed with a simple to remove windshield for low profile storage, a stainless-steel sport steering wheel, easy access to all boat control switches, a locking glove box, and an open area to flush mount electronics such as a fish finder, a GPS unit, and other marine electronics. The 210 FSH comes equipped with Yamaha's 4.3" Connext Touchscreen Display, which is NMEA® compatible to send vital engine information to third party electronics. Completing the helm is an angled footrest for comfort and stability when underway. Behind the helm is a padded leaning post with a backrest (on Deluxe and Sport). 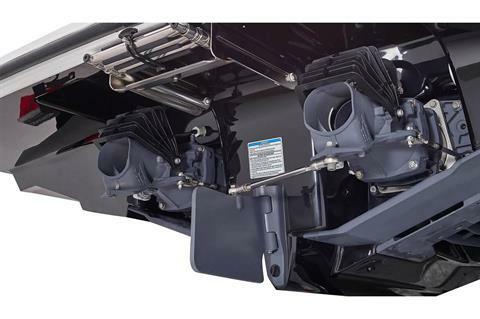 Under the lean post is a dedicated space for a removable cooler which is included on all models. The transom area on the FSH Series is unlike any other center console boat on the market. Since the engine and drive train are mounted in the hull, the entire back of the boat is open for unobstructed casting, towing and enjoying activities on the back of the boat. 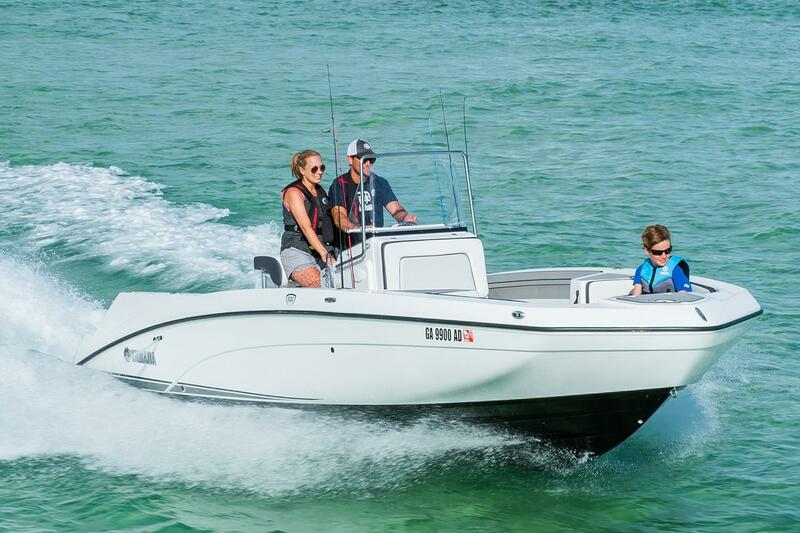 On the Deluxe and Sport models, the lean post is convertible and can be flipped back toward the helm for added comfort and versatility. 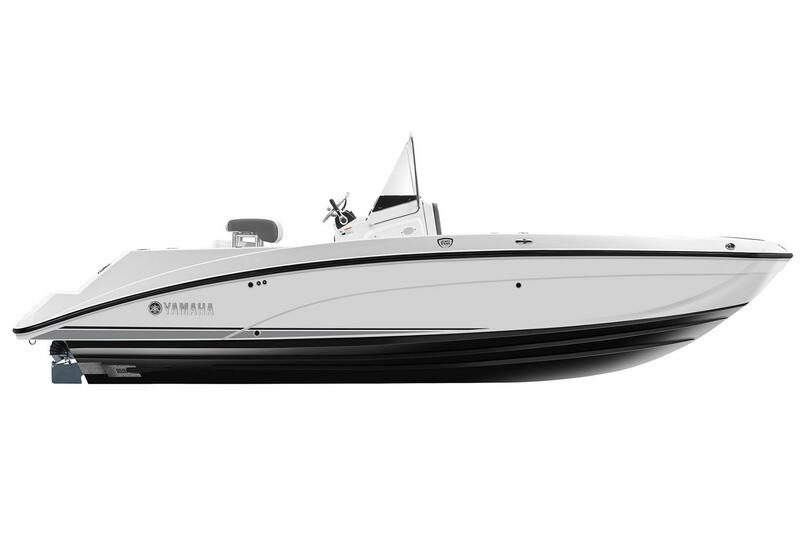 The 210 FSH features Yamaha's signature two-tier swim platform that sits low at the water’s edge. 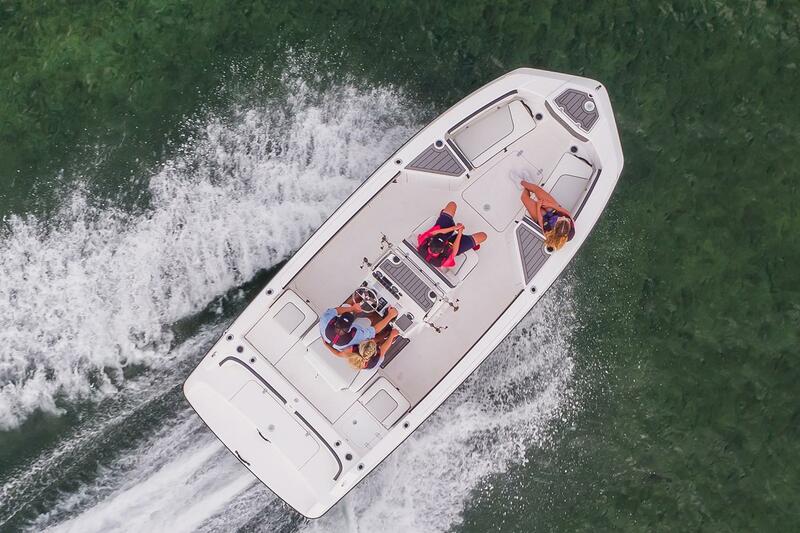 A retractable stern ladder makes reboarding after swimming a breeze. 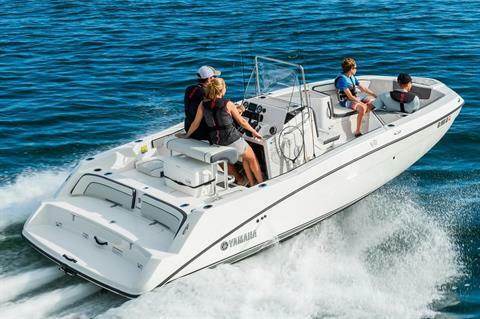 The transom also includes a tow eye for watersports. 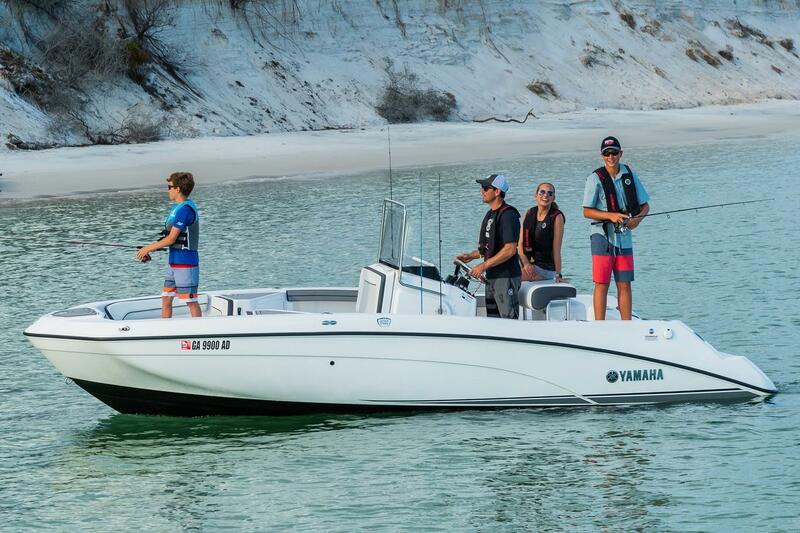 Like all Yamaha boats, the 210 FSH features Yamaha’s patented clean out ports that allow for the removing of debris from the jet pump without having to get in the water or swim under the boat. 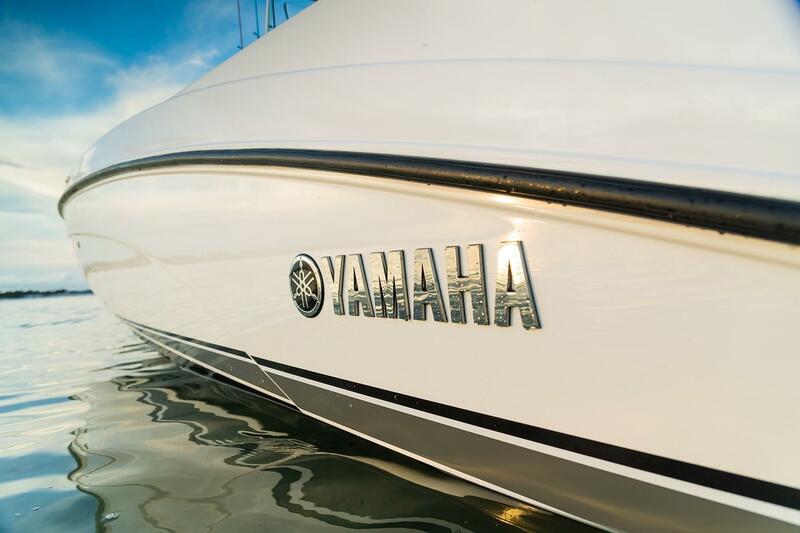 Rounding out the FSH’s list of innovations is the addition of Yamaha’s Articulating Keel, the latest in Yamaha’s Advanced Responsive Handling features. The Articulating Keel is an extension of the boat’s keel that moves and tracks along with the jet pump nozzle to provide comfort, stability and straight line tracking at all speeds.